"Toto Temple Deluxe is near perfect and delivers an amazing party experience"
"It's simple and addictive - what a multiplayer game should be." "It's fun, it's crazy, and you'll undoubtedly be yelling." 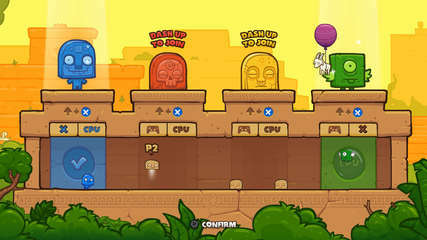 "It is stupidly fun. You'll likely find yourself standing in front of the screen, yelling at your fellow goat stealers and jostling them in real life." 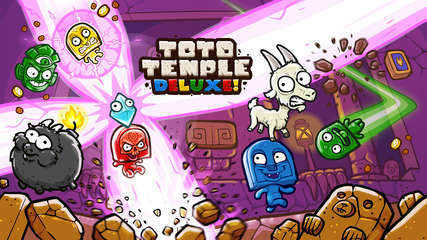 Toto Temple Deluxe is a fast-paced, local-multiplayer king-of-the-hill style game in which players must steal an egg-laying goat from their friends and try to keep it on their own head for as long as possible. You know, normal stuff. Infinitely dash in any direction to swiftly move around and powerfully headbutt the goat carrier to steal its four-legged booty. Escape your jealous opponents and protect the goat by blocking their attacks with a well-timed shield pop! You’ll "get their goat", guaranteed.